On 9 January 2016, the Google search pages in some countries (including the USA and Mexico but, curiously, not Canada) featured a Google Doodle about the amazing Monarch Butterflies. That day was exactly 41 years from when Ken Brugger and his partner Cathy Trail finally located the exact site of a major overwintering group of Monarch Butterflies in Mexico. Their effort was part of the research led by Canadian zoologist Fred Urquhart to try to determine what happened to Canadian Monarch Butterflies during the winter. Urquhart knew they fluttered south, but just where did they all go? Urquhart and his team of helpers tagged thousands of butterflies, and gradually homed in on an area of western Mexico straddling the border between the state of México and the state of Michoacán. It eventually emerged that there were several overwintering sites of Monarch Butterflies in that general area, and much of the zone is now formally protected, with strict conditions for visitors and restrictions on tree cutting and forest thinning. The Monarch Butterfly overwintering sites are a fitting topic of a Google Doodle. Sadly, the paragraph explaining the Monarch Butterfly Google Doodle repeats a common error about Mexico’s geography, and one we have featured previously on this blog. 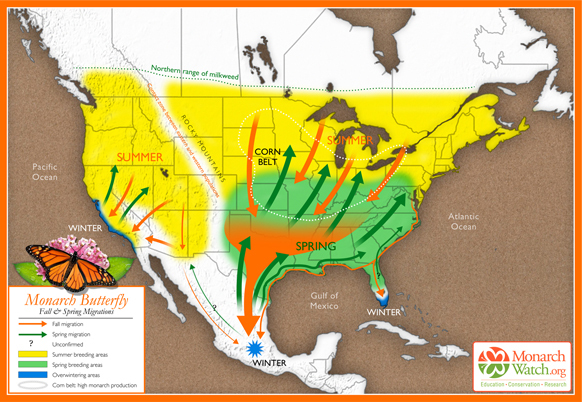 It places the Monarch Butterfly overwintering sites in “Mexico’s easternmost Sierra Madre Mountains”. Unfortunately, this phrase, even if oft-repeated on ill-informed websites, is far from true. Mexico has three major Sierra Madre ranges: The Western Sierra Madre, Eastern Sierra Madre and Southern Sierra Madre (see map). Mexico’s “easternmost Sierra Madre Mountains” would actually be the Southern Sierra Madre! The Monarch Butterfly reserves are not located in any of these three Sierra Madres; they are happily ensconced in the Volcanic Axis. Given that Google is reported to be introducing some form of reliability factor into its search algorithms, lending more credence to sites that are “factually accurate” and supported by other sites, this begs the question as to whether the majority is necessarily always right. 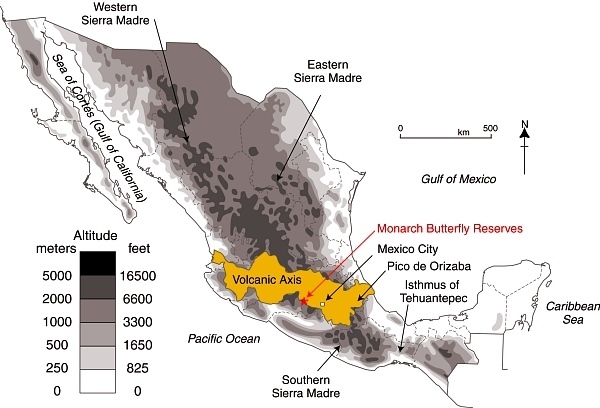 In this case, while there are numerous web references to the Monarch Butterflies hanging out in “Mexico’s Sierra Madre” mountains, they are all guilty of misrepresenting Mexico’s physical geography. Geo-Mexico congratulates Google for choosing to feature the Monarch Butterfly and loves the title “Mountain of the Butterflies” but does hope that Google Doodle writers will check their information more carefully next time. I hope you sent them a comment and correction! 🙂 thanks as always for the info. Well, they still haven’t replied, so I’ve stopped holding my breath.